The PeeNut system is super absorbent, flexible and easy to use. 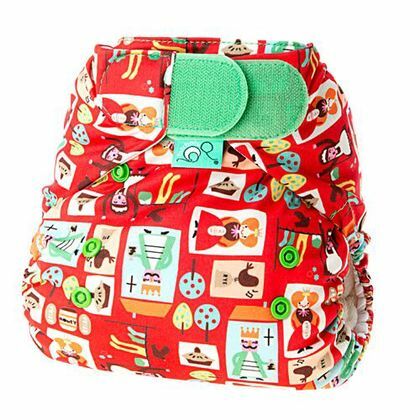 It’s a one-size reusable nappy system consisting of a waterproof wrap and a clever 3-in-1 bamboo pad/insert system providing great performance for both day and night-time, from birth right up to potty training. The PeeNut inserts snap into the PeeNut wrap to make an all-in-two nappy. With the size 1 wrap, you can use the small insert on it's own for tiny or light wetting babies, adding extra inserts as required for additional absorbency. With the size 2 wrap, use the larger insert on it's own or use both the smaller and larger inserts for heavier wetters or overnight. If the wrap is not soiled at change time, you can simply change the inserts and reuse the wrap. The wrap can also be used over fitted nappies too. Please note this listing is for the PeeNut wrap only; inserts are sold separately. You can add an insert to your PeeNut wrap here (max 2 inserts per wrap purchased) and additional PeeNut inserts can be purchased here.